I am not sure about you, but did anything significant happen in your life during these last few weeks of mercury in retrograde? For example, did any one of these things you rely on; your body, your computer, your car, your cell phone, break down irretrievably causing major inconveniences as you had to upgrade, replace or simply make the time to get it fixed properly? It seems this is the way of eliminating the old to allow access to all the new incoming frequencies. Simply put, our deep discomfort physically, mentally, emotionally and spiritually is just the result of adjusting to the new 5D vibrations. As we have discussed before, we can no longer handle or figure out things the way we once did in 3D. As we continue to cross the river of change, despite feeling the weight of the world on our shoulders, I can assure you that in surrendering without resisting we can breakthrough and shift into our new superhuman design. As a result, if you feel hollow, alone, and frightened it is perfectly normal because our monkey mind is fearful of fully claiming anything that in any way is different! I know we have all felt at one time or another that we had been punished in this lifetime or another for being our own authentic self; however, this is a different time and now the playing field has changed as we become the new super-humans. It is truly a paradox because our greatest challenge/trauma can be our most precious gift. My trauma brought me my life’s purpose. Spiritual activist and author, Andrew Harvey once wrote three words that can change a life, “Follow your heartbreak.” What had torn me down the most put me on the path of my true calling. I would probably have never known the joy I receive from writing these words to you week after week. Once we unpack what that heartbreak is we can then go out and help others so that they never have to suffer to the same degree. We learn through pain what kindness and compassion truly are. I never would be the person I have grown to be if it wasn’t for my pain. The passion for what I do could never have been taught, it had to be experienced through many heart breaking experiences. Now when I ask the Divine for help, the windows of opportunity continue to open up. I keep saying, “The only way to offset the outrageous pain today is with outrageous love!” We don’t grow because of the obstacles in our lives, we grow from them. The time has come for all of us to heal our lives and our monkey minds will create the path once we open up and listen to it. We now have at our fingertips so many new tools and techniques to up-grade and reboot ourselves as we are breaking the habits of being our old selves. We don’t have to return to that old way of thinking, feeling and being. Simply because in this new dimension it just doesn’t work any longer. In the new and wonderful book, ‘The Monkey Is The Messenger’, author Ralph De La Rosa is asking us, “With regards to the monkey mind, it poses the question: What purpose could it possibly be serving? What is it trying to tell us? 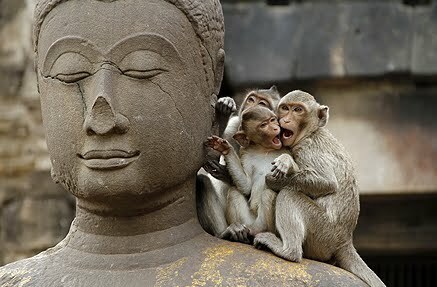 The monkey is asking you to go deeper with your life. The monkey is showing you what a life lived on autopilot looks and feels like, and it’s asking you if you’re really content with that.” . As we stand on the brink of a new way of being, it is essential that we use our awareness into anchoring a new state of receivership. The universe always wants more for us than we can want for ourselves. Since our own self-resurrection is where we need to focus on at this time, ending the separation inside ourselves and come into a state of self-acceptance, these tools are our life-boats for our sanity and for our soul. I invite you to continue to keep asking the Divine to reveal itself to you in whatever form you may need in that moment. For myself it was also asking to change into someone who can be more trusting, to feel contentment and to reside in the unknown until a clear path is shown. Basically, to accept with ease and grace whatever was happening. The world is being accelerated and amplified in so many different ways and so are we. Have compassion for yourself and give yourself the license to take a risk, jump off of that cliff and allow your magic to manifest. Much like downloading new software, you will only become even more fearful, anxious and agitated knowing that the old software no longer works in the new world. There is so much more to write in another museletter; however, I will end with another excerpt from the book and trust that whatever resonates within each of you will be exactly what you need to receive in the very moment of Now! For me, nothing can be more exciting or make me feel more fully alive than growing and being transformed. On that note, I continue to be so grateful for all of you who love and support me. It’s a wonderful world. Even though we feel we may have gotten lost along the way, maybe that is the path all along. For us to be able to continue the process of evolution, reinvent the body and resurrect our souls, while loving and supporting one another – obviously the journey is endless, much like ourselves! Have a gorgeous week. I love you madly.